Social change is important to social innovation, however, that change cannot be fleeting — it needs to last. 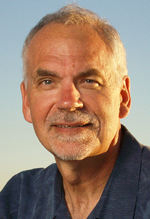 This idea will be front and centre at a free, one-hour webinar March 12 led by Al Etmanski, a senior fellow and co-founder of Social Innovation Generation (SiG) and founding director of the PLAN Institute. 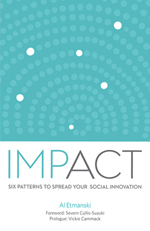 The webinar will largely focus on Al’s new book, Impact: Six Patterns to Spread Your Social Innovation, which emphasizes the difference between a strategy and a pattern. During the past 10 years, Al and his wife, Vickie Cammack, have been exploring social innovation. In that time, Al has observed six patterns of social change that have staying power. As part of the webinar, Al will share these six patterns and explain what they mean. His book also focuses on this paradox between short-term success and minimal long-term impact. Strategies, Al says, can only take you so far. What needs to be observed, he says, are the deeper patterns of change. “(Another) message (in the book) would be that social change is not for the elite; it is something that requires all of us to be engaged with and, in fact, most of us are,” Al says in a telephone interview. Al says the webinar and book are aimed at two groups of people. One group is young activists who are just starting out and who are passionate about a great idea that they want to make work. The second group Al’s looking to engage is experienced policy makers and funders looking for recent information. Al says the best thing people could walk away with from the webinar would be an understanding that they are not alone and they need to seek allies to create the change they want. “No matter how perfect your solution is and no matter how disruptive your innovation is, for it to become a part of the mainstream you need to work with not only your allies, but also people who may have been your adversaries,” he says. The webinar is being held March 12 from 1 p.m. to 2 p.m. Click here for more information on the webinar or to register. You can comment on this story below, or e-mail deron(at)axiomnews.com. Deron joined Axiom News in March 2007, having previously worked as a news reporter for print, online and wire services. He serves as Axiom News’ long-term care pod lead, after several years of writing stories and editorials for our clients in that sector. An award-winning advocacy journalist, Deron has seen first-hand the strengths long-term care brings to the greater health-care sector and through his work he seeks to share successes and best practices.